What is your alltime favorite pic of David Bowie? What's your favourite Bowie persona. Have you met or seen David Bowie? Does anyone else have an authentic signature of Bowies? Some of my covers of David Bowie material. check out my art work dedicated to album "LOW"
You Guys...I met David Bowie last night. Tweet along with a David Bowie film on Twitter. A book to David Bowie? great, cheap David Bowie must-have! 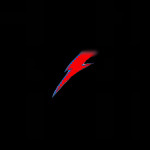 A song called "With David Bowie"
Ziggy Stardust: The Motion Picture. The society for the prevention of cruelty to long haired men.